Releasing a movie is always a hectic business, but especially so when you’re the producer-directors of an independently produced documentary and are willing to travel with your film. 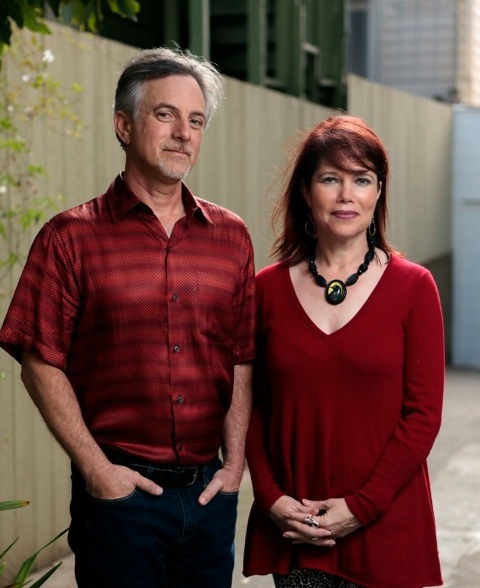 I managed to sit down for dinner with Dayna Goldfine and Dan Geller in San Francisco on a Monday night between two trips to Los Angeles to promote their intriguing new documentary THE GALAPAGOS AFFAIR: SATAN CAME TO EDEN. Dore Strauch and Friedrich Ritter in THE GALAPAGOS AFFAIR: SATAN CAME TO EDEN. A film by Dayna Goldfine & Dan Geller. A Zeitgeist Films release. I’d seen the movie at its debut at the festive 40th edition of the Telluride Film Festival. I loved its truth-is-stranger-than-fiction story about a couple of Nietzschean German expats who came to a tiny uninhabited island, Floreana, in search of peace and solitude in the 1930s. Their solitude was soon disrupted by the arrival of a homespun German family, and further marred by the bizarre appearance of a ménage-a-trois between a publicity-seeking self-styled Viennese baroness and her two lovers, intent on creating a Riviera-like beach hotel. Animosity flared among the three camps, until the tiny colony collapsed in a series of sinister and still-mysterious events: disappearances, shipwrecks, sudden deaths. 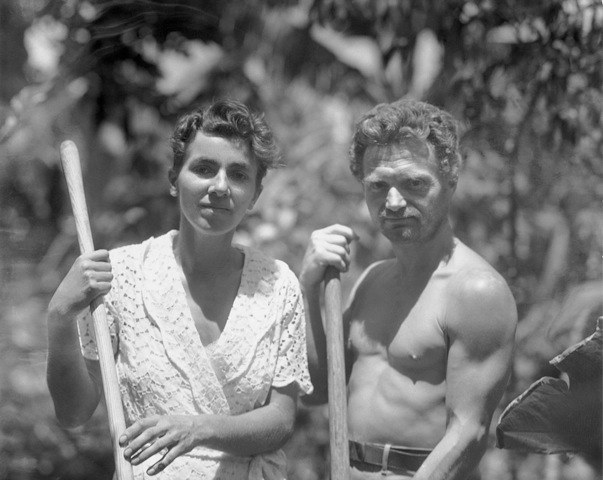 An amazing collection of vintage footage of the protagonists, mostly filmed by Allan Hancock, a wealthy Los Angeles industrialist who sailed to the Galapagos while on a scientific expedition with twenty scientists, is skillfully combined with modern-day footage of the descendants of the first settlers and other Galapagos inhabitants, investigating what it means to live apart from civilization—and its discontents. Monday nights can be challenging when it comes to finding a restaurant. The Galapagos are a province of Ecuador, and there is one restaurant in San Francisco, as it happens, Poquito (http://www.poquitosf.com/, 2368 3rd Street, 415 643-3900), whose menu offers all manner of Latin food, including Spanish, Cuban, and Ecuadorian, but initially I was also thinking of German food, since all of the settlers involved in the central mystery of the film came from Germany. Dan came up with several ideas, all within walking distance of their house. We eliminated the excellent Suppenküche (http://www.suppenkuche.com/, 525 Laguna Street, 415 252-9289), because it’s noisy and their attractive wooden chairs can be unforgiving over time, and settled on La Urbana (http://www.laurbanasf.com/, 661 Divisadero Street, 415 440-4500), a newish modern Mexican place, and a favorite of Dan and Dayna’s. And we chose the early hour of 6:00 PM, hoping it would be quiet—or anyway as quiet as a hip new restaurant can be. Dayna and Dan are delighting in the transformation of their neighborhood, which they’ve lived in since 1998. It was christened NoPa, for North of the Panhandle, by dint of the efforts of the first upscale restaurant (Nopa, http://www.nopasf.com/, 560 Divisadero Street, 415 864-8643) to open thereabouts. “La Urbana has been open for about six months,” Dan told me. “I know,” I said, “when I Google-mapped it, the photo is of that grungy old plant store that was there forever.” (How quickly things change: I check a few days later and find the photograph has changed to the sleek, chic gray façade of La Urbana, still identified as 661 Divisadero, although the entrance is now around the corner, on Grove Street). The most frequently asked question? “Who do you think did it?,” they chorus, since the plot of the film is something of a murder mystery. “And has any footage been artificially distressed,” they say, which is the result, they think, of reaction to documentaries that use re-created footage. Sarah Polley’s STORIES WE TELL, which we agree is a terrific movie, used footage with actors portraying real people, which was designed to look vintage and surprised many who only realized after the fact that it was not. We also agree that might be the reason that it was not nominated for an Academy Award in the Documentary category. Everything on La Urbana’s menu looks good to me, especially on a first visit, so I defer to Dan and Dayna, who’ve been here several times. We begin with half a perfectly ripe avocado, which we spread on La Urbana’s house-made thickish small blue tortillas, served warm ($5): simple and delicious. We continue with beautifully-arranged small plates of pork carnitas, served on a huarache (sandal-shaped) piece of brioche, atop meaty small mayocoba beans under a drift of queso fresco ($11); tender, expertly grilled octopus, flavored with pimentón (smoked paprika) and mustardy leaves of brassicas ($15); and a clever and refreshing salad of mâche, aparagus, nopales cactus, and toasted pine nuts, tossed with a tangy citrus cilantro dressing. This was already the best meal I’d had in a long time. Helped along, of course, by the conversation. We jumped from topic to topic – other movies, including some from Dan and Dayna’s twenty-year, many-film collaboration, especially one of my favorite dance films of all time, BALLETS RUSSES; our families; cultural life in San Francisco—but always returned to THE GALAPAGOS AFFAIR. As often happens, the story of how they came to make the movie is fascinating and mysterious in its own right. In 1998, Dan and Dayna were hired to shoot animal footage for a National Science Foundation-funded project in the Galapagos, and en route to the islands, read a book in the onboard one-shelf “library” called The Enchanted Islands: The Galapagos Discovered. A 12-page chapter proved especially exciting: it was entitled “Murder in Paradise” and introduced them to Dr. Friedrich Ritter and Dore Strauch; Heinz and Margret Wittmer and their family; and the Baroness Eloise von Wagner and her two lovers, Robert and Rob. The Baroness in THE GALAPAGOS AFFAIR: SATAN CAME TO EDEN. A film by Dayna Goldfine & Dan Geller. A Zeitgeist Films release. Was there a documentary in the story? Everybody except Margret was dead, and she wouldn’t talk about it. But the same friend who’d taken them to the Galapagos in 1998 called years later with exciting news: there was a hidden archive at USC with 16mm footage shot by wealthy adventurer Allan Hancock, which might include film of the Floreana colony. Initial inspection was disheartening, as the reels were disintegrating, but careful restoration revealed a treasure trove: Ritter and Strauch building their enclave, planting, even Dore dancing with her favorite burro; the Wittmers’ cozy home in old pirate caves; and the Baroness flirting with everyone. The chef d’oeuvre for me is an astonishing amateur fiction film, complete with intertitles, shot by the obviously ensorcelled Hancock, in which the Baroness steals a newlywed husband honeymooning on the island and tricks him into shooting her companion. The Baroness, a jolie-laide in the tradition of (a prettier) Lotte Lenya, is costumed in a thin scarf-top that clearly reveals her breasts. Yikes! A year of enjoyable research ensued, not only in the Hancock archives, stuffed with photos and documents as well as the film reels, but on eBay, where Dayna found many lurid tabloid articles and copies of the several books written about the events, including Dore Strauch’s own Satan Came to Eden. Five more trips to the Galapagos resulted in the enthralling 120-minute THE GALAPAGOS AFFAIR. Our own enjoyable research, deeper in the thickets of La Urbana’s principales, or main courses, led us to slightly over-order: two mains would probably be enough, but everything looked appealing. The crispy-skin fish with mole ($24) was essential to evoke the islands, and both our server and Dan plumped for the braised beef short ribs, served with avocado puree and pico de gallo ($29). Dayna was taken with the alluring, springy description for the arroz con pollo: served with farro, English peas, crema, and pea flowers ($26), and so was I, so we ordered it, too—though I didn’t remind them that it was a dish of boiled chicken that supposedly carried off one of the last to die in the carnage that ended the Floreana colony’s idyll. After such a feast, we ignored the temptations of chocolate ganache with mescal gelee and almond streusel, or a semifrio, aka semifreddo, layering frozen custard and blood orange sponge cake with orange sorbet, candied citrus, and pistachio crumble—my God, that sounds good to me now!—for a sensible and shared dish of lemon granita and orange sorbet amped up with a spicy dusting of chile pequin ($9). I wondered how Dan and Dayna had assembled their stellar and impeccable international voice cast that includes Cate Blanchett, Diane Kruger, Connie Nielsen, Thomas Kretschmann, Sebastian Koch, and Josh Rador. With the help, it turns out, of famed casting director Margery Simkin (veteran of everything from BEVERLY HILLS COP to AVATAR, with stops in-between at FEAR AND LOATHING IN LAS VEGAS and ERIN BROCKOVICH). Why? Simkin herself had been on a cruise in the Galapagos in 1986 when her boat broke down near Floreana and she met Margret and learned of the mystery, which she never forgot. After trips to the Telluride, Hamptons, and Palm Springs film festivals, a screening in Minneapolis put on by the Ecuadorian consulate, and a wonderful time in Berlin at the 2014 Berlinale, hosted by the ebullient and erudite Dieter Kosslick—“it was like a fairy tale,” Dayna said—the pair were looking forward to a screening in May at the Ecuador Documentary Festival. Future international festivals, including Tel Aviv, Australia, and New Zealand, were on the horizon. I still wanted to talk about the haunting original score, composed by Laura Karpman, and scored in Spain, but they were flying back to LA the next day, and it was time to go. Dan and Dayna walked me to my car, parked a couple of blocks away. Well, actually, past the car, which I blame not on the margarita, but the fact that it was a borrowed vehicle that night, and not my own. (That’s my story, and I’m sticking to it.) As I slid behind the wheel, I saw a “9” illuminated on the dashboard clock, and thought “Three hours—that’s the longest meal I’ve had in ages.” A second later and I realized the numbers after the “9” were so close to “59” that it made no difference. I was both surprised and elated. What’s better than a FOUR-hour meal during which the conversation never flagged? Not much. Dan Geller and Dayna Goldfine. Photo courtesy of Chris Hardy. Meredith Brody, a graduate of both the Paris Cordon Bleu cooking school and USC film school, has been the restaurant critic for, among others, the Village Voice, LA Weekly, and SF Weekly, and has written for countless film magazines and websites including Cahiers du Cinema, Film Comment, and Indiewire. Her writings on books, theater, television, and travel have appeared in the New York Times, the Los Angeles Times, and Interview. This entry was posted in Eat, Films and tagged documentary, Eat, Films, Meals with Meredith, Mexican. Bookmark the permalink. Hey Mer! Great to see you back in the food writing world again.